One month after a peer-to-peer group in Hai Lang, Vietnam, learned how to use mirror therapy at home to relieve the symptoms of phantom pain, they met to share their progress and the impact of the therapy on their lives. The impact was profound; a solid model for a network of other peer-to-peer amputee groups to meet in Quang Tri Province, Vietnam. Most of the amputees said that their pain was improved or reduced from at least 30% up to 80% and are thankful for the therapy. Several people revealed that they had drank a lot of alcohol to forget their pain, while others stated that their pain would drive them to anger easily when relating to family and friends. Now, they said, practice with the mirror has helped them in these matters. All of the participants look forward to further progress and are highly committed to remain in the project until it is completed in March, 2015. 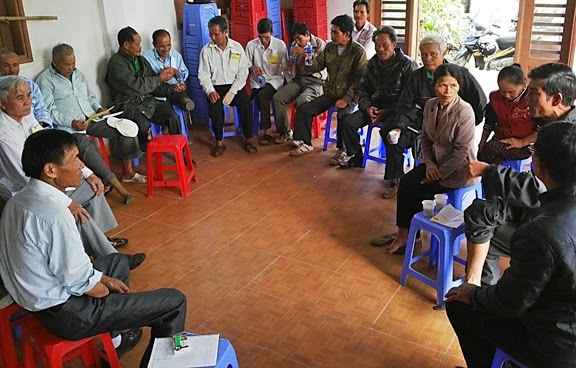 According to Nguyen Thanh Phu, the next step for Project Renew is to team up with the Quang Tri Provincial Disabled People's Association to seek resources for expanding the model into the Association's grassroots networks, so that more and more amputees can benefit from this effective, inexpensive treatment.